The Mayor, Cllr Elias Mattu and Club President Paul Lockley, flanked by a cohort of Centurions. The Rotary Club of Wolverhampton thanks the Patrons, who provided the funds, and the walkers and runners,whose laps of the Stadium released those funds for the charities. Please join us for Best Foot Forward 2018, on Saturday 7th July. 460 people covered a total of 14,252 laps between 8am and 8pm. 24 runners were admitted to the BFF Centurion Club, having exceeded 100 laps of the Stadium. Since Best Foot Forward was first staged in 2013, £58,000 donated by corporate Patrons has been distributed to the nominated event charities. In addition, other charities using the event to boost their own funds, have raised £40,000. 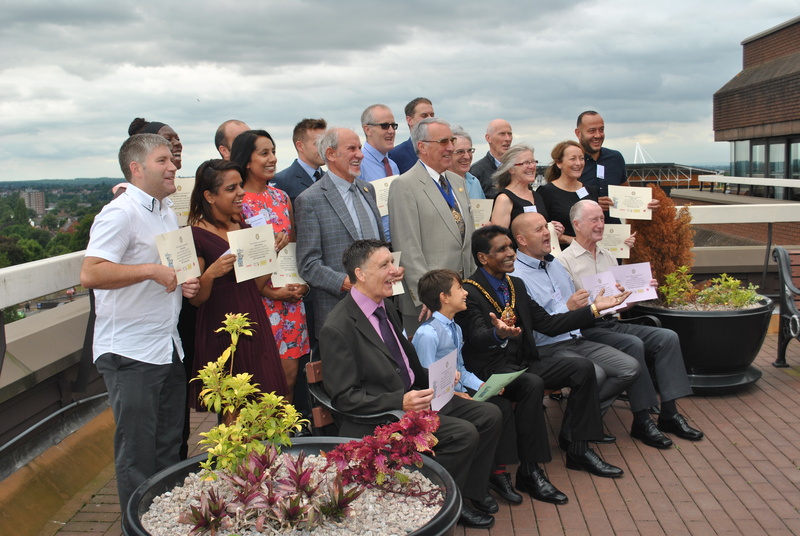 In a presentation held in the Mayor’s Parlour in August, cheques for £4,000 derived from Patron donations, were presented by Mayor, Councillor Elias Mattu, to Wolverhampton MS Therapy Centre, Central Youth Theatre and The Rotary Charitable Trust. The total amount raised from this year’s event, from Patrons and independent charities, was £22,297.